The Sam Houston State University Police Department Building has recently undergone renovations that pay homage to a long history of dedication and service. The department—which formerly shared its building with the SHSU Small Business Development Center—has expanded massively, allowing larger, much more open workspaces for all officers, dispatchers, and parking and transportation personnel. As the university continues to grow, the police department must also expand its capabilities and services, according to chief of police Kevin Morris. The new renovations made space to triple the size of the department’s evidence room and establish a processing area unique to the university police department. Increased space in the facility allows for the possibility of an addition of five more officers, enough to bring the force to full capacity. Among the upgrades were the addition of signs that glow green at night, which pay homage to 17th century Watchmen who patrolled New York City carrying green lanterns. Most noticeably, the building has been dedicated to Charles W. Tackett, a change that was authorized by the Texas State University System Board of Regents in 2013. 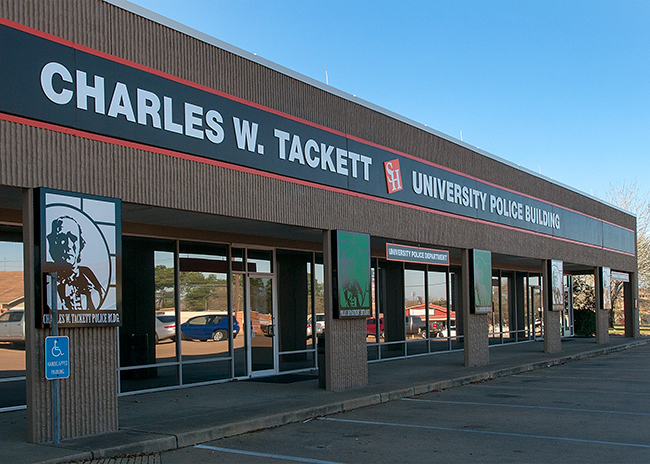 Tackett worked 55 years in Texas law enforcement and retired from SHSU in 2005 after serving 32 years as the university’s director of public safety and chief off police. 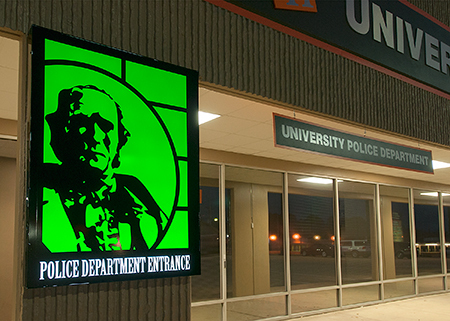 In addition to the renaming of the building, passersby will notice green lights with a depiction of Gen. Sam Houston flanking the doors of the police department. The tradition of green lights outside a police station goes all the way back to 17th century New York City. In that time, the “Watchmen” who patrolled the city carried lanterns at night with green glass sides as a means of identification. When the Watchmen returned to the watch house after patrol, they would hang their lanterns on a hook by the front door to show people seeking help that they were inside the watch house. “Today, green lights are placed outside the entrances of police stations as a symbol that the ‘Watch’ is still present and ever vigilant, something upon which the police department at Sam Houston prides itself,” said Carlos Hernandez, vice president for finance and operations. Hernandez collaborated on the renovations to bring the green lights to Sam Houston State University. Although the changes made to the department spell a bright future for such an integral service, the massive renovations took about nine months and posed a challenge for current officers.